Whatfor) a few months ago. A beautifully realised homage to classic sixties pop with a heavy Kinks influence, it remains one of my favourite releases of 2008 so far. As a consequence, I had high hopes for Expensive Vomit in a Cheap Hotel. After all, I mused, if the drummer can write a near-classic, what kind of artistic heights might the full band be capable of scaling?Regular readers may remember my enthusiastic review of the solo album by Sleeping in the Aviary drummer Michael Sienkowski (released under the nom de plume Whatfor) a few months ago. A beautifully realised homage to classic sixties pop with a heavy Kinks influence, it remains one of my favourite releases of 2008 so far. As a consequence, I had high hopes for Expensive Vomit in a Cheap Hotel. After all, I mused, if the drummer can write a near-classic, what kind of artistic heights might the full band be capable of scaling? It seems I let myself get a little carried away. 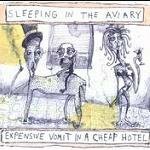 While it’s not a bad record by any stretch, I can’t help but feel a touch disappointed by Sleeping in the Aviary’s latest offering. It’s decent indie-rock fare, sure, but in a sense that’s the chief problem with Expensive Vomit; like many other artists currently operating in the genre, SitA’s music is often good, yet seldom great. The melancholy piano-led You’re a Party is one notable exception, and certainly the strongest track here, but for the most part Expensive Vomit in a Cheap Hotel – which, for the record, is a truly atrocious album title – consists of mid-tempo, rough and ready indie-rock tunes. You’ll have heard their kind before, but if you must download one I’d have to recommend the rousing opener Write On.